From the copper and lead ore that the ancient Egyptians used to create the world's first cosmetics to the scientifically advanced products of today that can do everything from hide pores, smooth complexions, and turn the pale green of your eyes a vivid shade of emerald, makeup has been an integral part of humankind for thousands of years. Over the centuries, women used burnt matches to darken their eyes, berries to stain their lips and young boys' urine to fade their freckles. They even swallowed ox blood in some misguided attempt to improve their complexions. Women throughout history put their health at risk with many of their homemade cosmetics. In some cultures, for example, women used arsenic, lead, mercury, and even leeches to give themselves the pale appearance deemed beautiful in the old days. Thankfully, we've come a long way from the days of using toxic and deadly mixtures to enhance our looks. Today's multibillion dollar cosmetic industry must meet strict government regulations about what it can and cannot include in products and must follow safe manufacturing guidelines. Today, the most serious injury you're likely to receive from your cosmetics is an irritation from a product that is too harsh for your skin, or an allergic rash from a fragrance or a preservative in the product. 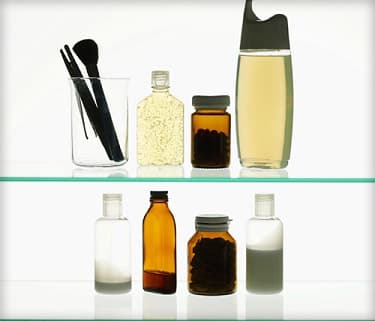 Yet, despite decades of safety testing and a safety record unparalleled in many industries, there are many myths circulating about the dangers of cosmetic ingredients. CosmeticsInfo.org: "A History of Cosmetics From Ancient Times."